CS Unitec’s chain saw and pipe clamp system is ideal for clean, straight and oil-free cutting of high density polyethylene (HDPE) heavy wall pipe in the natural gas, municipal waterworks, petrochemical and power generation industries. Model 5 1027 0040 PC is designed with a chain brake to stop chain kickback. The clamp holds the saw to the pipe assuring straight cuts and safe operation. An integrated water feed system cools the material being cut, if needed. The powerful 4 HP motor consumes 92 CFM of air at 90 PSI. 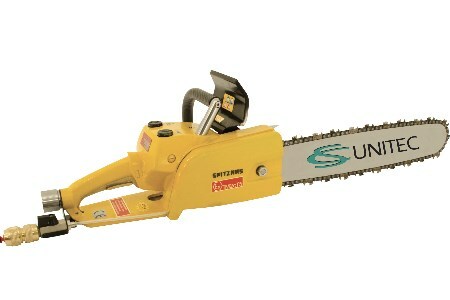 The saw is equipped with a 25 in. bar. Other models are available with 15 in., 17 in. and 21 in. bar lengths to suit your application. Optional ripping chains or carbide-tipped saw chains are offered for special cutting applications. Model 5 1027 0040 PC is ATEX certified and suitable for use in wet conditions, hot work zones, Ex zones and other hazardous environments.